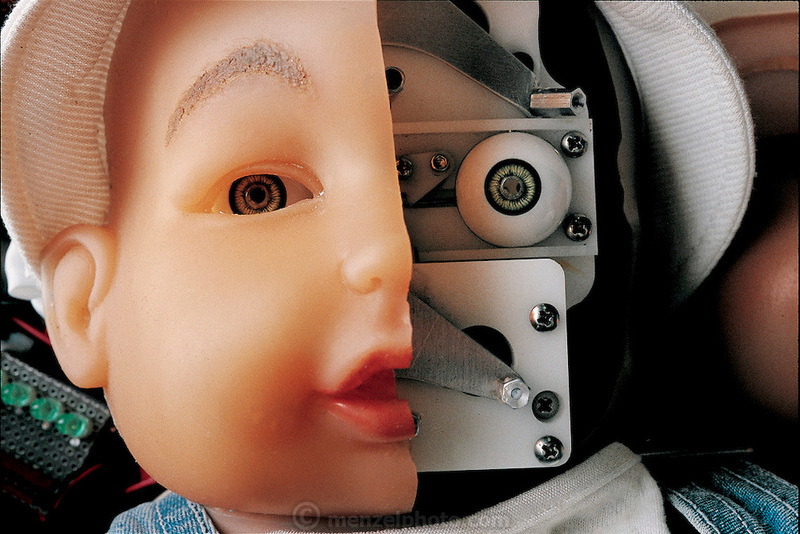 Baby It's skin partially removed to reveal its inner workings, this prototype robot baby can mimic the facial expressions of a human infant by changing the contours of its lifelike rubber face. Called BIT, for Baby IT, the mechanical tot is yet more proof that much robotic research will see its first commercial application in the toy and entertainment industry. My Real Baby, the market version of BIT, is scheduled to debut in US stores in late 2000; it is a collaboration between Hasbro, the US toy giant, and iRobot, a small company started by MIT researcher Rodney Brooks. Somerville, MA. From the book Robo sapiens: Evolution of a New Species, page 229.